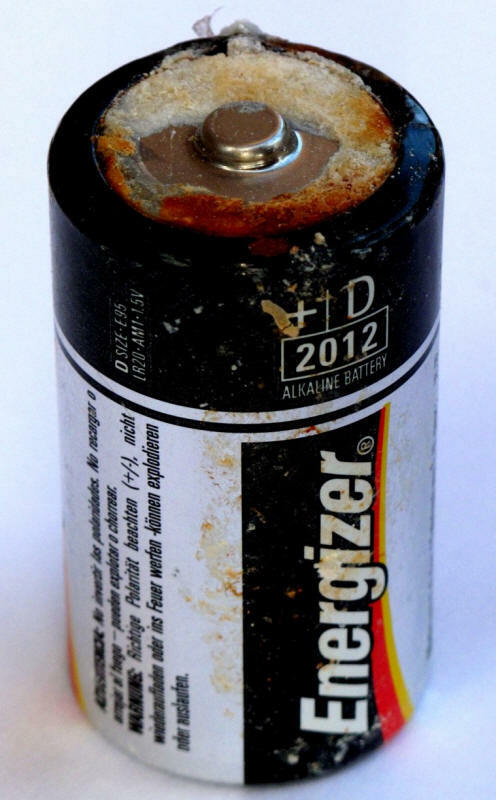 Alkaline battery leakage can be quite corrosive. When the concentrated caustic gel that is required to provide high performance leaks out out the metallic container it basically can destroy every material in the local environment it creates. Fortunately, the alkaline cell shown in the following picture corroded while in cool storage, as all these cells should be to preserve their useful life. Imagine what could have happened to the contacts or any other electronics that would have be touched by the corrosive paste! Well, this happens all the time and sometimes has been the ruin of some very expensive or irreplaceable equipment.